When you can anticipate everything you may need, it helps make your adventure a success. This guide is about preparing for campouts. (Originally Published in 2001) - Our first campout was in our backyard. We were only allowed to go inside the house to use the facilities. This way we got to practice setting up the tent and outdoor cooking. But the biggest advantage was we made a list of things we should "have brought" but didn't. That way when we had our first away from home campout we came well prepared! Do you have a list of items you "never" want to forget when you go camping? Or any camping preparation suggestions that have helped you over the years? Send them to brainstorm@thriftyfun.com or post them below. - Always bring your pocket knife, rain poncho, flashlight (with an extra set of batteries), string/rope, toilet paper, and plastic bags. - A small toiletry kit should contain a tooth brush, tooth paste, comb, chapstick, hand lotion, and soap. I always tried to put in some facial tissues. Things to put up long hair (elastics) are great on hot days. - Small backpacks are great for day trips. - Dress in layers with a wind breaker on the top layer. Don't forget hats, gloves, and warm socks/shoes (weather dependent). - Develop a checklist. It may depend on the "type" of camping you do (i.e., tent, cabin, camper, etc. ), the time of year, length of the trip, and how far you might have to carry your gear. - Pack all of your stuff in sturdy bags and don't over pack your bags. The ideal situation is carrying all of your personal gear in one trip. - If you are going to be around water, be prepared. Bring your swim suit, towel, sun lotion, hat, sun glasses, flip flops, glass case (if needed), etc. You might also think about whether shoes and socks might need to be worn to the beach. For those who go out in boats and canoes, a strap may be needed if the person wears glasses. A shirt and shorts may also need to be worn over a swim suit if you will be out on the water for an extended period of time. - Do your homework in advance to know what is and is not available at the facility. - After each trip, evaluate what you did and did not use (and why you did not use each item). Also, indicate items that you could have used. Update your checklist(s) accordingly. 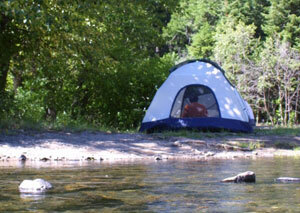 - Evaluate what worked well and what should be changed for your next camping trip. - Firestarters are easy to make, and help out when the wood is wet. - Bring your matches in a waterproof container. Another option is to waterproof your matches by dipping them into nail polish or melted paraffin. - Start fires only in designated fire bowls. - Have a bucket of water near by any open flame. - A bandana is a versatile item. It can be used as a fire scarf, a sling, a wrap (in case of an accident), a "bag" on a pole, hot pad, headband, neckband, wash cloth, etc. A damp bandana around your neck feels great on a hot day. - Bring something to sit on. (Commonly known as a sit-upon.) There are now camp stools, portable camp chairs, and portable director's chairs. - A mess kit and a silverware set are quite handy. The mess kit includes small pans that can double as a plate and bowl. It generally has a plastic cup with measuring lines on it. - A compass is a handy item. - I had a small manual can opener about an inch or two in length. It was hinged, and it had a sharp blade that you had to work around the lip of the can. - I always liked to put in pen/pencil and some paper in a plastic ziploc bag. - Bring small butter containers for your food leftovers. - Have a plan for cleaning up (dishes, bathroom facilities, trash disposal, etc.) Think about sanitation. - Decide ahead of time what to do with wet things on the ride home. - Have a contingency plan in case of natural disaster (especially in case of a flood if you are tent camping). - Remember your First Aid kit. Make sure at least one person in your group has a current First Aid certification from the American Red Cross or American Heart Association (or similar organization). - Make sure you know about any health concerns (bee allergies, etc.) of your group members. - Leave your itinerary with a trusted friend or family member and include contact information for each member of your group. Bring along the contact information for that individual who has your itinerary. - Determine in advance how and what you will be eating and cooking. The two easiest meals should be the one right after you arrive and just before you leave. 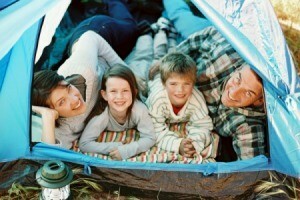 - Practice putting up your tent in the dark if you plan to arrive as it is getting dark. - Store all food in closed containers, so as not to attract animals, bugs, etc. - One pot meals means there is only one pot to wash! - Trail mix is a great snack, and it can be made with a variety of ingredients. - Ziploc bags can be used to mix up ingredients and then the food can be squeezed out of the bag. - The more simple your meal preparation is, the more time you have to do other things!